THURSDAY THOUGHTS! - World's most trusted leader, or ostrich or bull? 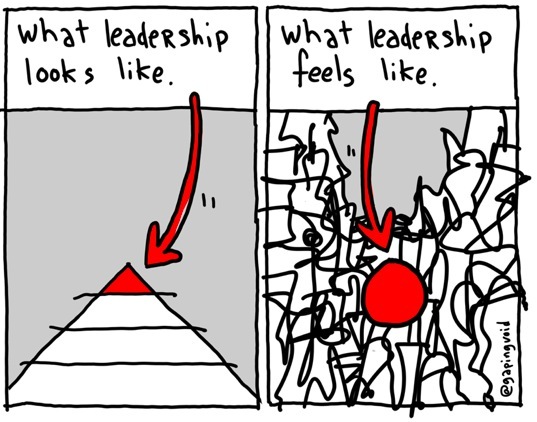 This is a graphic explanation of leadership. The theory on the left looks nice and neat, whereas the practice on the right looks like chaos. It looks like chaos because many a person who now considers themselves to be “a leader” feels like that when they are expected to step up to the mark and demonstrate leadership traits. The theory on the left is what managers learn about leadership from books or business schools: that leadership is the pinnacle of a pyramid of management and promotional circumstances. The practice on the right is their experience of that pinnacle, on a daily basis! Leadership is easy until you factor in people. Unfortunately, leadership is very much all about people, leading them, their competences, their time along paths they might not wish to travel. At this point, the “leader”, i.e. you, particularly if it’s left unchecked in your early leadership career, either becomes an ostrich or a bull, because this is all about successfully dealing with tensions and resistances. The key issue at this point is to determine commitment. Your own as well as your team’s. Because those who are not committed, merely find fault and blame. Those who are committed, find a way! I have witnessed many an encounter where someone has spent a significant amount of time telling me why something can’t happen, or why they can’t do something, or even why its all going to go so terribly wrong. You know the conversations. No alternatives are provided, or means of overcoming sought. It’s just gloom and doom all the way. To illustrate a point of a previous Thursday Thoughts!, they are the folk who provide little or no discretionary effort, if left to their own devices. These are the folk who should bring out the best of your management and leadership traits, as they are the ones who provide most challenge to you. So, whats your reaction to this? Do you assume ostrich tendencies, and bury your head, perhaps turning to others to support you and dismissing them as “obstructive”? This suggests neither of you are truly committed, to the task or to the relationship. Do you become a bull, and force your ideas and thoughts through despite all their reservations? You give the appearance of listening to them, but at the end of the day, you are going to do this “thing” whether they like it or not! This suggests you are committed to the “thing” but not committed to them! They will see through this bull-behaviour, they always do, and beware what they are saying outside the team. Your reputation is growing by the minute. As a bull that is! Or do you listen, process what they are saying, walk a moment in their shoes, rationalise their concerns and either drop the issue if, on reflection they are (shock horror) right, or find ways to make something, not necessarily the original idea, happen and produce a win-win scenario related to the issue at hand? This demonstrates a committed leader. Committed to the task, AND committed to the people they rely on to deliver for them. This tendency will certainly motivate teams to listen back in the future and new ideas will always be given due consideration, not dismissed out of hand. I don’t think any successful leader has always got it right – they are only human after all. But the most successful ones take their coaching seriously in order to find these pathways more of the time. Leave the ostrich and the bull tendencies behind, take the first step in building that reputation for being one of the “most trusted” leaders, today! Leaders are easy to follow and easy to raise ideas or concerns with. Managers are not, necessarily, on the other hand. Is this a reflection of a current or recent experience Peggy? It usually depends on the level of competence of the individual, whether that be a leader or a manager. Both should be easy to approach with knotty issues. At the point this is not so, a situation of active disengagement arises. Following a leader takes a high degree of trust – where it is absent, folk won’t follow and the bull emerges.